Daniel Pudil admits he is relishing the prospect of coming up against Sheffield Wednesday team mate Barry Bannan tonight. Pudil’s Czech Republic host Bannan’s Scotland in a friendly in Prague this evening with both men looking to strengthen their claims for further international calls. And after sharing the same dressing room this season, Pudil says he is intrigued by the opportunity to pit his wits against his fellow Owl. “It will be really interesting to play against him and hopefully we can be on the pitch together,” the 30-year-old said. “I am really looking forward to playing against him. “It is a friendly game but I want to win it. “We are friends but it will be interesting to playing against him. “We’ve had a few chats about it. It will be nice to see him there. 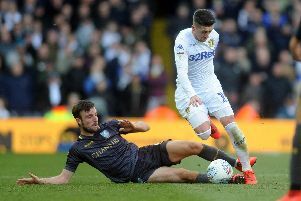 COMMENT: Do Sheffield Wednesday actually need any new players in loan window? It has only been in the last year where Bannan has failed to receive regular call-ups to the Scotland squad, after wining the first of his 23 caps in 2010 under Craig Levein. But there is a hope his sublime form for Wednesday this season will see that end. Scotland boss Gordon Strachan has spoken of a need for Bannan to score more goals. While the 26-year-old has only managed two this term, team mate Pudil believes Bannan has more than justified a return to his national team. Pudil said: “He’s a good player and he’s deservedly back in the national team. “He’s a really important player in our team. “Most of the games he has played in front of me on the left wing. Pudil is facing his own battle to re-establish himself as an international footballer –and a pressing one at that given the Czech Republic’s participation in Euro 2016 this summer. Though he featured in a pair of friendlies in November, Pudil was last selected regularly during 2014. While he admits a place in the squad for this summer’s tournament in France is a goal, it is not the only thing on his list of priorities over the next few months. “It is a busy few months,” he said. “I’ve got so many targets from helping Sheffield Wednesday get into the Premier League, signing a new deal here and playing at the Euros.